One thing that my children really enjoy is looking at books. 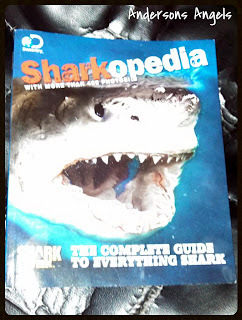 So I was excited when I got the opportunity to review the new Sharkopedia book from the Discovery Channel. Since we will be visiting Florida next week I like that the boys and I have gotten the chance to sit down and look at this wonderful book. 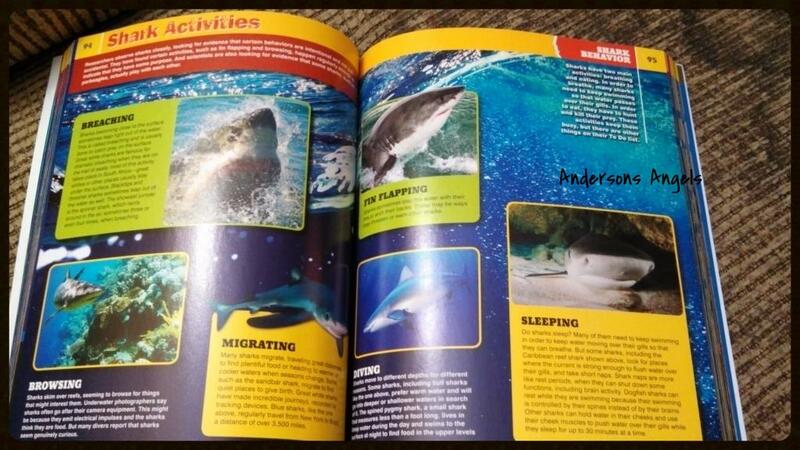 It allowed me to show the boys different kinds of sharks, their teeth, their habitats, and many other great things. Jake was worried at first that the book may scare the boys and not make them want to go in the water but I used it as a learning resource to teach the boys that sharks are not bad animals. I grew up in Florida and have lots of memories of the beach's being closed when the sharks were close to shore. The sharks were not coming inland to attack anyone but were just looking for food and had no intentions of harming anyone. I think this is something that we need to teach our children because people have made all sharks out to be vicious animals when not all are. If we teach our children about the sharks habitats and feeding cycles it will be easier for them to understand these animals and how to respect them. I think the Sharkopedia would make a great resource to add to anyone's library of books. It has so many great pictures and descriptions inside that really help teach you about all the different kinds of sharks. The book also touches on shark bites and what they think typically causes them. Sharks are unpredictable animals so know one really has all the answers just the knowledge we gain from watching and observing them. If you would like to own your copy of Sharkopedia you can buy one for $19.99 from the DiscoveryStore.com . You can come back here on August 2nd and enter to win a copy in my Back 2 School Bash 2 Giveaway Event. My kids love to read these books, and I love that they're learning while reading! This looks awesome! Defiantly a great way to learn about sharks! I know they get a bad rap, hopefully this will teach many kids! My boys lovw these types of books. I keep waiting for them to discover the sea and all of its creatures, but right now we are still in Dino land... I love sharks. This looks great. So I don't ever want to see a real shark! Haha! But this book looks so fun! I love Shark Week on Discovery Channel. Big Sis would love looking at this book and learning about sharks! Fun book to add to our collection! This would be a great book for my grandson! He would really enjoy it! We love the Discovery channel! And my 3 year old daughter has recently become obsessed with all animals with big, sharp teeth and talks about them all the time. She loves sharks, alligators, etc! My dd would love this! She loves anything that lives in the ocean! Now if I could just get her to get over her dislike of bugs (other than rolly pollies!) we'd be set! Gosh, I hope I never see one in person but I guess you gotta educate yourself on them so you at least have a fighting chance. We don't live close to the ocean, but my granddaughters are fascinated when shark specials are on television and they love to go to aquarium in Tulsa, I think that your review would interest others into persuing this book. My oldest son will really love this book and the pictures look awesome!! I think my grandchildren would love the Sharkopedia book. We love the Discovery Channel. Lots to learn. I bet my son would like these. Would LOVE to have this for my library! My son would love this book, he is aspiring to become a shark scientist. My son would love this book, it may scare me though. I read the book that inspired Jaws while at my cousins house, at the Jersey shore.Don't know why I did that since we were going to the beach the next day. My grand kids live in Florida, and my grandson would love this. It looks like the sharks practically jump out of the pages at you!